New!! 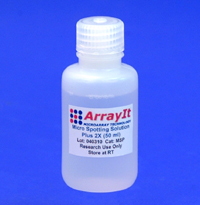 Arrayit NanoPrint™ 2 LM60 microarray printers build on the enterprise level linear drive systems that have provided the market’s most advanced universal platforms for microarray manufacturing for more than a decade. 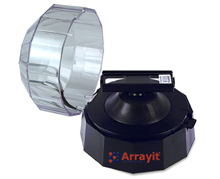 Based on advanced nanotechnology with version 2 motors, controllers and Ethernet connectivity, Arrayit NanoPrint™ 2 LM60 robots offer 500 nanometer resolution and sub-nanoliter sample dispense volumes using Arrayit’s patented high-throughput contact printing technology installed in 4,200+ laboratories worldwide. NanoPrint™ 2 LM60 instruments, with a 3 microplate and 60 slide capacity, set a new standard for high-speed microarray manufacturing in research, diagnostics and pharmaceuticals. 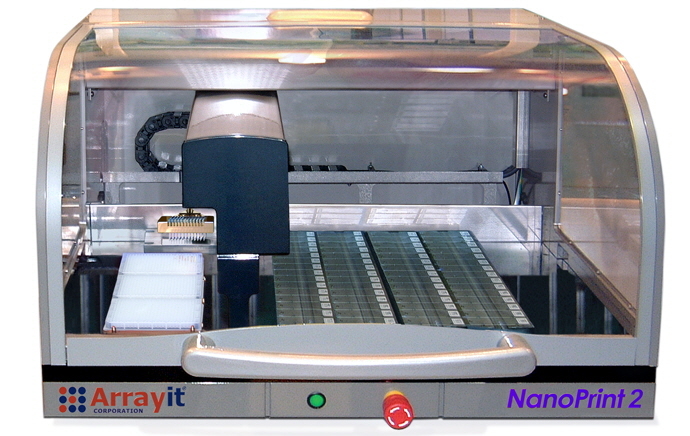 Systems include NanoPrint™ Microarrayer, one year warranty, 16 patented contact printing pins, professional series printhead, anti-vibration table, accessory control module (ACM), computer, LED computer screen, keyboard, mouse, mouse pad, tubing and cables for rapid installation and use.